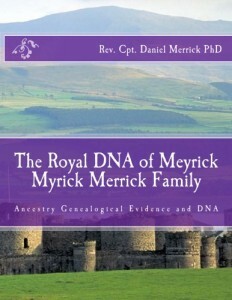 D W Merrick Titles Only; Bibles and Private Genealogy Books Excluded; Allow 4 to 6 weeks for delivery; USA residence only. Daniel W Merrick PhD has worked over 20 years to complete this family tree with DNA research and countless hours in historical records. This book documents the Genetic and Historical Royal, Mayflower, and Revolutionary War Veteran lineage in Genealogy. This Merrick Foundation Org book brings together this branch of the family who came to America in 1636 with the four brothers from Wales, John, James, William, and Thomas Merrick. Ahnentafel from Daniel W Merrick going back to Biblical Genealogies. The links below include free PDF books on Biblical topics of importance to those who seek the truth, the whole truth and nothing but the truth. To order printed copies click the books linked above to go direct to Amazon ordering page. YOU CAN NOW GET FAITH RADIO ON TUNEIN.COM ON YOUR SMART TV & Follow us. All Rights Reserved. Press and Media Permissions granted upon request or in the event of interview.